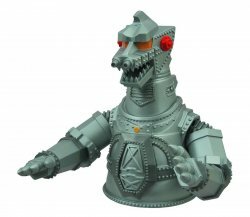 From Diamond Select's line of vinyl coin banks features Mechagodzilla as he appeared in the 1974 classic movie Godzilla vs. Mechagodzilla! Godzilla's greatest foe is launching his attack! 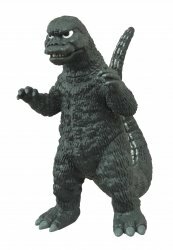 A cybernetic copy of Godzilla with superior firepower, this vinyl coin bank of Mechagodzilla is based on how the robotic kaiju appeared in 1974's Godzilla vs. Mechagodzilla. Eight inches tall, the bank features poseable arms and a coin slot in his back, as well as an access door in the base. Sculpted by Gentle Giant Studios! Collectors Note: Brand-new and picked directly from the manufacturer's cartons. Comes in bag. Before viewing video, check your speakers (turn 'em down half way) as this video music medley is loud!